Casio America has introduced its Exilim EX-FH20. The new point-and-shoot digital camera costs $599.99 and will be available in October. 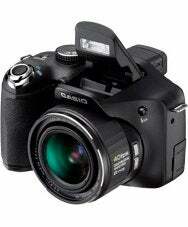 The Casio Exilim EX-FH20 can record high-speed videos and shoot up to 40 frames at a time in burst mode. The EX-FH20 features a 9.1 megapixel sensor and a 26mm-equivalent wide angle lens with 20x optical zoom. It also features anti-shake capabilities, a night scene setting and the ability to record movies at 1280 x 720 pixels at 30 frames per second (AVI format). The EX-FH20 is the latest Casio Exilim model to feature a high-speed “burst” shooting mode. It can capture up to 40 frames per second at 7 megapixels, in a single burst. The camera can also record high-speed movie footage — you can set the recording speed at 30 fps, 210fps, 420 fps or 1,000 fps, recording motion you can’t actually see. The camera records still images in raw or JPEG format, and writes data to an SDHC memory card. It’s also compatible with SD memory cards, MultiMediaCards and MultiMediaCardPlus. Casio’s Web site had not been updated with information about the EX-FH20 as Macworld posted this article.